Sometimes the birds we see take a lot of work. I wouldn’t know about that myself, as I am a legendarily good birder who finds everything with no effort. Or I’m a legendarily lazy birder. One of those, for sure. But I’ve certainly read accounts of people trudging for miles in stinking rainforest in the hope of spotting some infernal pitta. Or, even worse, some irritating LBJ that looks the same as all the other ones you’ve already walked past, only this one is different, because of the call or the shade of brown on the lores or something. It’s exhausting, and after I’ve read these accounts, well, it’s enough to put you off ever birding again. Now me, I like knowing about the rare birds, but its also really nice to know about what’s really common at a site too. Because chances are the person reading the account isn’t from the area, so even the trash birds seem exotic. Not a House Sparrow or Common Myna common, common everywhere common, but common here and not really so much so everywhere else common. Local common. So, this one’s for free, if you have ever wanted to see an African Finfoot, go to Lake Mburu in Uganda. I saw about twenty of the things on a single boat trip around the lake to look at game. Seriously, that lake has finfoots like lakes in England have ducks. Don’t let that bird be a nemesis bird (like it was to a friend of mine), just take yourself there. 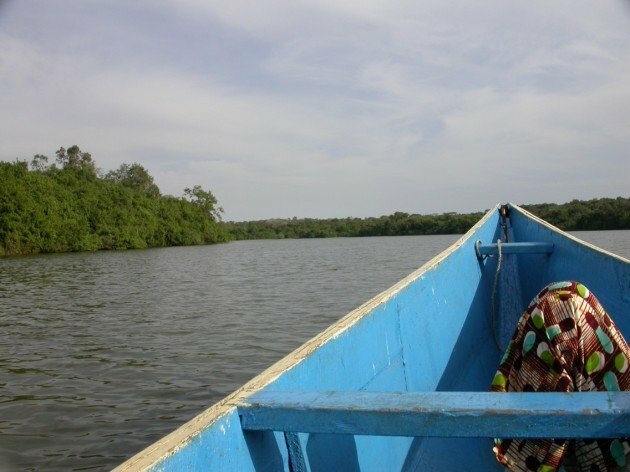 Lake Mburu. Come for the finfoots, stay for the drunken encounters with hippos! I got slightly sidetracked there, because I’ve been thinking about Africa quite a bit since last week’s post, particularly since it’s been a long time since I was there and long past the time I should have gone back. I don’t have many good bird photos from my time there, but I do have a few of one of those local common. 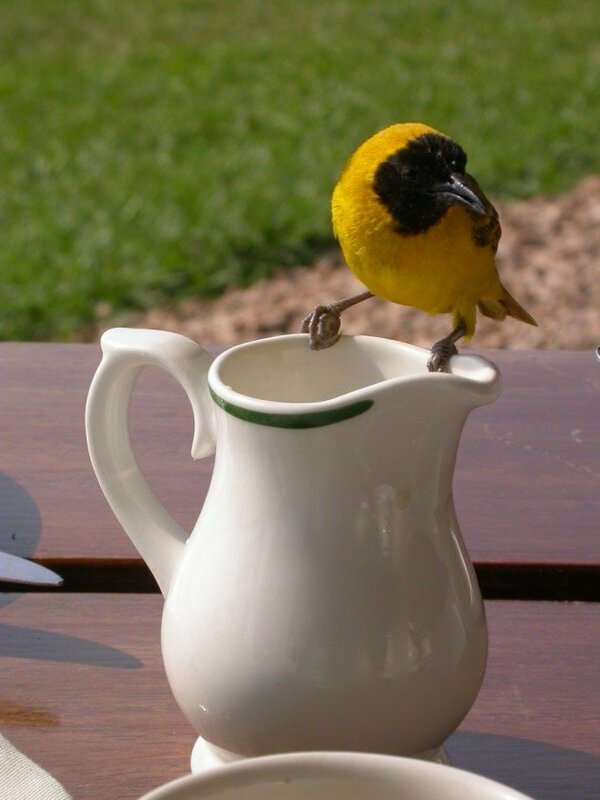 This species was common as muck at Mweya, a safari lodge in Uganda’s Queen Elizabeth National Park. 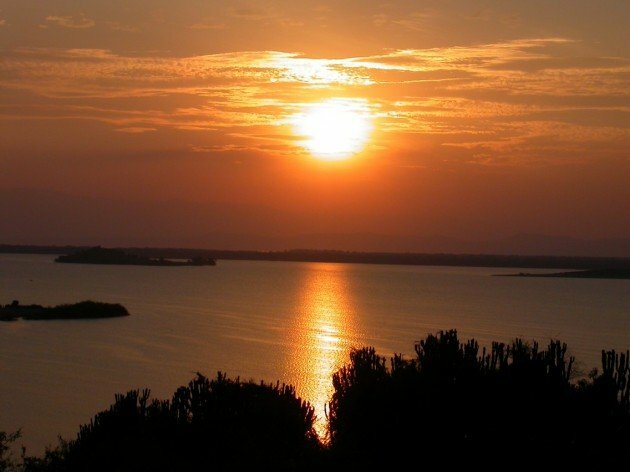 The lodge is, quite frankly, the best lodge I have ever been to or can even imagine, based purely on its location, sitting on a rise above the promontory where the Kazinga River feeds into Lake Edward, one of the smaller Rift Valley Lakes. As you stand, drink in hand (yes, alcohol is an important part of the safari experience), warthogs grazing at your feet in that odd kneeling down way they have, one can take in both the channel of the river and the lake as well as the Rwenzoris (the Mountains of the Moon) and the sun setting over the neighboring Congo (Democratic Republics thereof). Honestly, the view is to die for before you’ve even seen an animal or a sip of drink. Lake Edward with the Congo behind. There is a lot of wildlife around the lodge. Swamp Flycatchers stand out as common birds knocking around taking flies, but the most aggressively common bird you’ll find on the terrace is the Slender-billed Weaver. I don’t really know much about the species, I don’t even know if much is known about them. 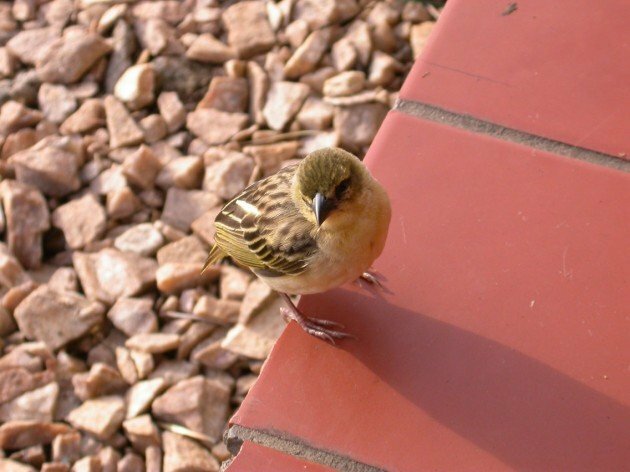 They occur widely over Africa, but I’ve never seen them anywhere else. 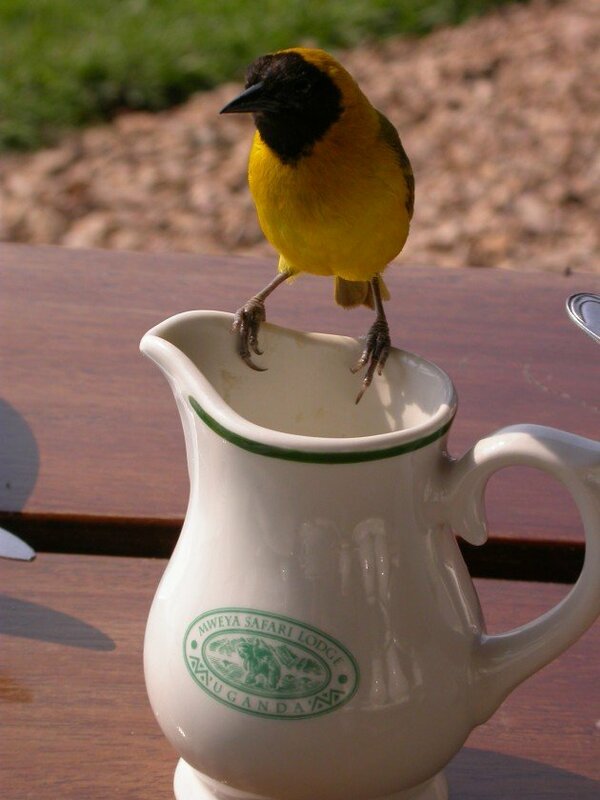 In fact they behaved like sparrows do elsewhere, coming up to the breakfast tables at the lodge. On my first visit I saw females and youngsters. Is this even a Juvenile, or is it something else? My books are in the UK, so I can’t be sure. Spin the milk jug around for a bit of product placement. Birding is easy. Have breakfast, and they shall appear. If you want to see more great images of birds check out our big and growing page of photo galleries, 10,000 Clicks! Great article. I think the humor is as good as the bird is pretty. Looking forward to more articles. Your article MADE MY DAY!! I agree with Laura and Tom, great post! 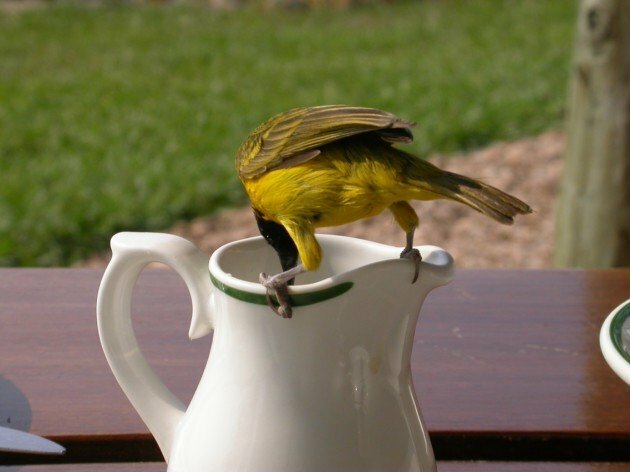 Having “birds for breakfast” reminds me of our trip to Hawaii where birds constantly fluttered through windowless openings of the restaurant to nibble on scraps at vacated tables. It made birding very easy! Thanks for sharing these birds. I spent a night in a tent by that river in Queen Elizabeth Park many years ago and woke in the night to the sound of a very large jaw chewing just on the other side of the nylon. Cape buffalo? Hippo? Terrifying but thrilling. 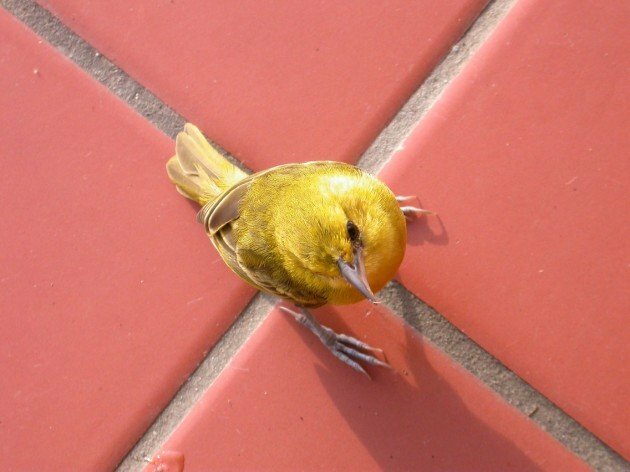 Sadly, that was before I fell in love with birds, so I was blind to those bright yellow guys. Thanks for the reminder of happy days. 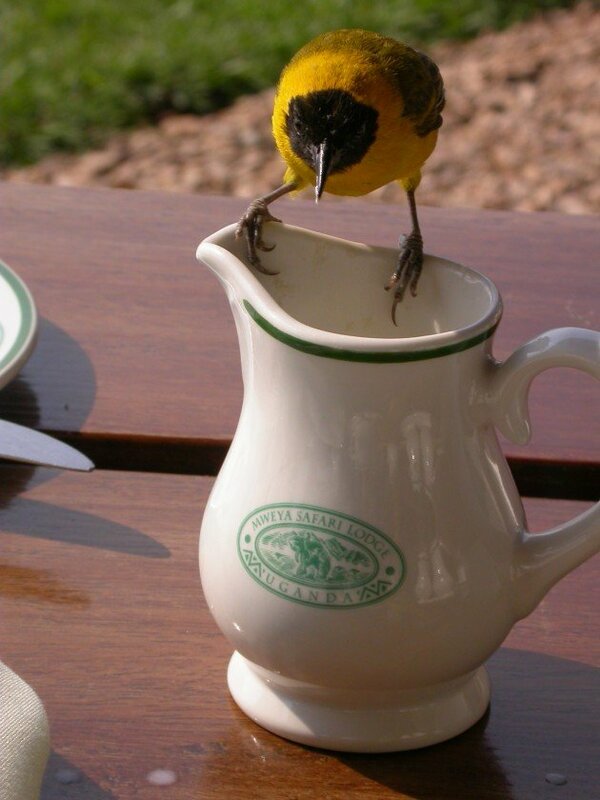 I’d love it if that came by, and stuck its beak in my morning milk! Great post! Aelian’s On The Nature Of Animals: The Classics Can Be Fun! 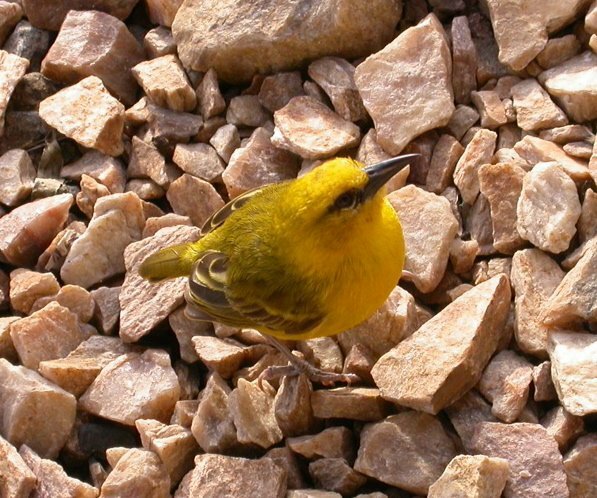 Where Are You Birding This Final Weekend of December 2010?